In bygone days rural communities often organized working parties, turning labor into social events. Hog killing, corn shucking and cane grinding were examples of this phenomenon. Music and a meal were standard parts of these rituals. During World War II families and communities were scattered, and these social events started fading away. As we look at our lives now, many of us pine for the days when there was time, energy and desire for the rituals that solidified families and communities, turning necessary work into good fun. A Southern cane grinding is similar to a New England maple syrup cooking. Maple sap gathering and cooking extends as long as the sap is flowing, from three to five weeks, with syrup boilings whenever the holding tank gets full. Cane grinding now is usually done in one hectic day, making it more suitable for a work party. Here in the Deep South, sugar cane has always been the sweetener. Prior to World War II almost every farm in the South had a cane patch to provide the year’s sweetener and the surplus served as a welcome cash crop. In addition, cane could provide the enhancer for localized liquid corn products. 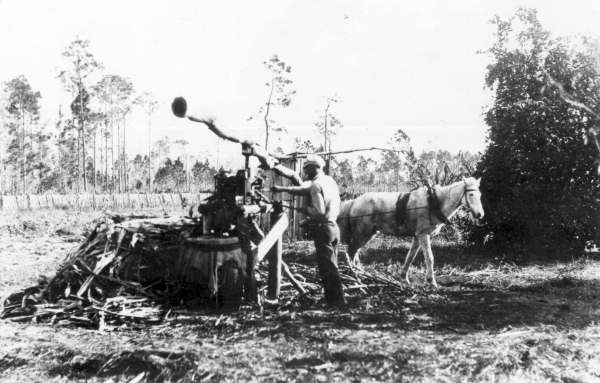 Cane grinding circa 1911. Image from the Florida Photographic Collection. Cane is typically harvested around Thanksgiving. Large crops used to take several weeks to be harvested and boiled. First, the freshly cut and stripped cane is crushed in a roller mill to extract the juice. The raw, greenish brown juice tastes somewhat like vaguely sweet “grass tea.” Some folks really enjoy this treat. The mill was traditionally powered by a blind mule walking in a circle at the end of a pole, which directly turned the mill’s rollers. The more modern use of a tractor PTO (power takeoff) for power doesn’t seem to affect the taste but for my memories it is noisy, smelly and out of place. Next, the juice is boiled down to syrup consistency. 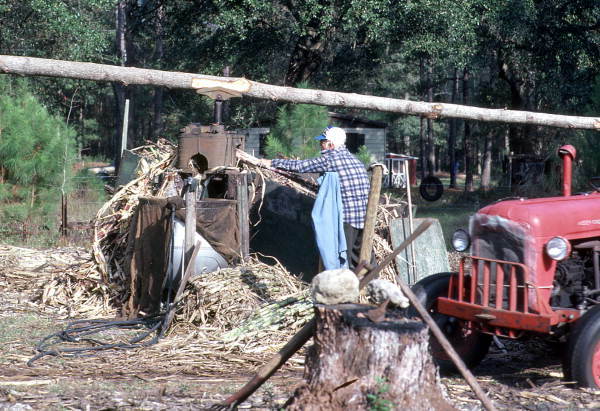 Wilmer Cribbs grinding sugarcane for making into syrup - Wellborn, Florida. Image from the Florida Photographic Collection. On the Grissett farm west of Tallahassee (where I have attended many a cane grinding), thick black smoke from the “fat lighter” fire and controlled confusion were the norm as Roy and Wayne Grissett would keep the fire roaring and the foam skimmed off of the 6-foot diameter cast iron syrup kettle. A chilly November wind keeps the crowd close to the steaming kettle. It is very hot and humid inside the open syrup shed, in stark contrast to the weather outside. Bees of all types are attracted to the sweet juice and smell but I’ve never seen anybody get stung. When the viscosity is just right the fire is pulled from the firebox and the syrup is poured off and strained into a container so that it can cool enough to be bottled in old style 1/5 gallon glass bottles. This process is repeated until all of the syrup has been cooked. A traditional cane grinding is always accompanied by a “covered dish” dinner (the noon meal for you non-Southerners), served and eaten outside by the syrup shed. All of this is generally accompanied by home-made music. Our band “Scrub Oak” has often been asked to play for the cane grindings at the Grissett’s farm west of Tallahassee. We play our version of “Antique Country” or “Pre-Grass” music with fiddle, guitar and mandolin both before and after the meal. About mid-day folks start bringing in covered dish food, salads and desserts. The blessing and eating can start as soon as Gayle’s fresh biscuits arrive. Then one of the essential rituals is to see how much syrup one can pour into a fresh cooked biscuit and still be able to get it into your mouth without sticky tragedy. Kids are the most skilled at this sport. Every kid old enough to have a pocketknife is carrying his or her own stick of fresh cane. They deftly peel and cut off chunks to chew, swallowing the juice and then spitting out the empty pulp. They may also cut off a chunk for a smaller, as yet uninitiated kid. The two brothers are now only one. Last year’s grinding was a memorial for Wayne Grissett, a beloved husband, father, brother and friend who passed on just a few weeks before this years grinding. The crowd is huge as the community comes together to remember Wayne and pay its respects to the family. We see again the many benefits of families and communities coming together for work and fun, for grieving and healing. Mr. Miller, your aticle mentioning my father brought tears to my eyes, and so many wonderful memories to mind. My father Wayne and my uncle Roy and other family were fully dedicated to keeping the “old timey” traditions alive, I will painfully miss the grindings but it is a comfort to me that he will live on through so many people’s memories, including yours. Thank you.